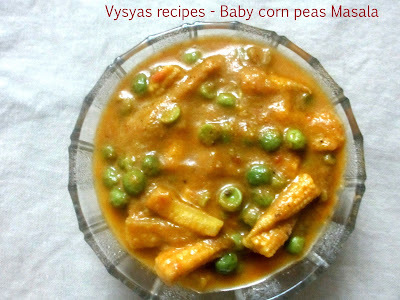 Baby Corn is a good source of folate or folic acid.it is rich in proteins,Vitamins and iron and richest source of Phosphorous.Baby corn is rich in fibrous protein and it is easily digestable.Green peas also improves Metabolism of Proteins,carbohydrates and fats.Now we prepare delicious Baby Corn Green peas Masala.It goes very well with Roti, chapathi's,pulav's,jeera rice and fried rice. Saute chopped Onion for few minutes then saute chopped tomatoes saute well,add cinammon sticks,cloves,fennel seeds to it and saute well till every thing becomes mushy.grind sauted items along with cashews(as such) into a Smooth paste with needed water. Cut baby corn vertically and chop into 1 inch pieces as shown in above picture. Take water in a kadai add baby corns, then add needed water, little salt and turmeric.let it boil for 10 minutes. crunchyness should be maintained.Drain the water and keep baby corns aside. Take peas and cook it similarly by adding water in kadai, till it becomes soft and keep it aside. Take a kadai add oil when it it hot, add ginger garlic paste saute well till raw smell goes. Add cooked baby corn saute for 2 minutes,then add cooked peas saute for 2 - 3 minutes. Now add ground paste and needed water, when it starts boiling add chilli powder,coriander powder and garam masala, and needed salt.Allow it to boil ,till it becomes thick paste. It goes very well with Roti, chapathi's,pulav's,jeera rice and fried rice. Note:if you want more spicy add garam Masala, else not needed.